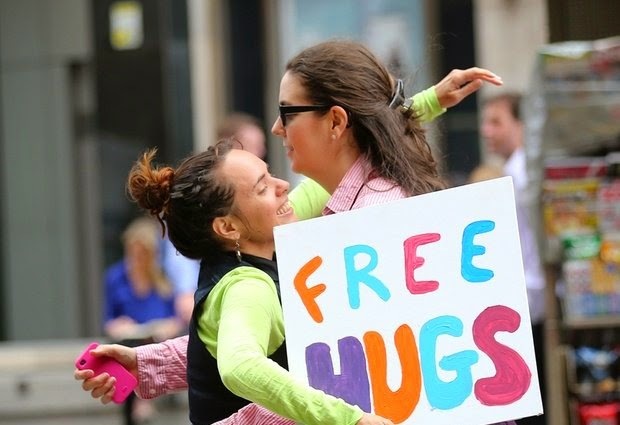 Michelle Cotterill, left, gives a woman a hug in the street at a temporary memorial site close to the Lindt cafe in the central business district of Sydney, Australia, Wednesday, Dec. 17, 2014. Cotterill said she had a steady stream of hug requests from the mourners who visited the site to pay their respect and leave flower tributes. Three people including a gunman were shot after police ended a siege in the city coffee shop in on Tuesday morning Dec. 16, 2014. SYDNEY (AP) — A gunman responsible for a deadly siege in a Sydney cafe was once on the national security agency's watch list — but was dropped off it years ago for reasons that remain unclear, Australia's prime minister said Wednesday. Man Haron Monis, a 50-year-old Iranian-born, self-styled cleric described by Prime Minister Tony Abbott as deeply disturbed, took 17 people hostage inside a downtown Sydney cafe on Monday. Sixteen hours later, the siege ended in a barrage of gunfire when police rushed in to free the captives. Two hostages were killed along with Monis. Abbott said that Monis was on the Australian Security Intelligence Organisation's watch list in 2008 and 2009, but was later dropped from it. The agency was watching Monis because he had sent a series of offensive letters to the families of dead Australian soldiers, Abbott said. "I don't know why he dropped off the watch list in those days, I really don't," Abbott told reporters. Monis was convicted and sentenced last year to 300 hours of community service for sending what a judge called "grossly offensive" letters to families of soldiers killed in Afghanistan between 2007 and 2009. He later was charged with being an accessory to the murder of his ex-wife. Earlier this year, he was charged with the 2002 sexual assault of a woman. He had been out on bail on all the charges. "We particularly need to know how someone with such a long record of violence and such a long record of mental instability was out on bail after his involvement in a particularly horrific crime," Abbott said. "And we do need to know how he seemed to have fallen off our security agency's watch list back in about 2009." Abbott also said Monis, who wielded a shotgun throughout the siege, had a gun license. But the New South Wales police later said they checked with the state firearms registry and found no record of him ever holding a license. "Plainly there are questions to be asked when someone with such a history of infatuation with extremism, violent crime and mental instability should be in possession of a gun license," Abbott said. "We have very tough gun laws and I guess we can be pleased that he didn't have a more potent weapon at his disposal. But why did he have a gun license in the first place?" Abbott's spokesman later released a statement saying that federal security officials had told the prime minister that the National Police Reference System — a database holding all state and territory police records — showed that Monis had been the owner of a New South Wales firearms license. The federal police commissioner was investigating the origin of the entry, the statement said. Abbott promised a transparent investigation and the government was expected to release a report in January looking into all aspects of the siege. The prime minister said it was impossible for security agencies to monitor everyone, forcing them to make judgment calls about who posed the greatest risk for committing violence against innocent people. Just three days before Monis began his deadly rampage, Australia's highest court refused to hear his appeal against the convictions for sending the letters. The next business day, a shotgun-wielding Monis walked into the cafe, just a short stroll from the courtroom where the ruling was delivered. New South Wales state police Commissioner Andrew Scipione said police had asked that Monis not be granted bail, but the court ruled otherwise. Asked why Monis was not on any national security watch list, Scipione noted that the charges Monis faced were not politically motivated. Thousands of tearful Australians continued to pour into Martin Place on Wednesday, a plaza in the heart of Sydney's financial and shopping district where the Lindt cafe is located. A makeshift memorial had grown into a mountain of flowers left to honor the hostages killed: Katrina Dawson, a 38-year-old lawyer and mother of three, and Tori Johnson, the cafe's 34-year-old manager. Officials have not said if the two died in crossfire as police stormed in or were shot by their captor. Small boxes of Lindt chocolates had been left among the candles, flowers and cards, and a steady stream of mourners signed memory books for the victims. A wooden cross with the words "I'll ride with you!" lay nearby, referring to the hashtag #IllRideWithYou which was tweeted tens of thousands of times by Australians offering to accompany people dressed in Muslim clothes who were afraid of a backlash. Bouquets were also attached to the police barricades that surround the cafe, along with an Australian flag emblazoned with the words, "Vale Tori Johnson" and "Hero," a nod to reports that Johnson brought the standoff to an end by grabbing Monis' shotgun, saving the lives of most of his fellow hostages. Monis grew up in Iran as Mohammad Hassan Manteghi. In 1996, he established a travel agency, but took his clients' money and fled, Iran's police chief, Gen. Ismail Ahmadi Moghaddam, told the country's official IRNA news agency Tuesday. Australia accepted him as a refugee around that time. The police chief said Iran tried to have Monis extradited from Australia in 2000, but that it didn't happen because Iran and Australia don't have an extradition agreement. Abbott said he wanted to know how Monis had been granted permanent residency and why he had been receiving welfare benefits for years, despite being able-bodied "if not necessarily of sound mind." Associated Press writers Nick Perry in Sydney and Rod McGuirk in Canberra, Australia, contributed to this report.